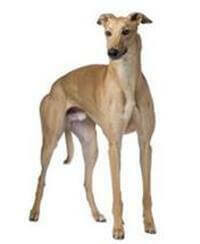 Generally, Greyhounds live up to 12 years of age but have been known to live longer with the right care. The average female Greyhound is between 62 and 68cm tall and weights between 24 and 30kg, while the male is slightly larger at 67-72cm and 30-35kg. The retired racing greyhound makes an affectionate pet and, contrary to popular belief, is not a highly strung or aggressive dog. They are in fact very docile and very loyal animals. Through regular exposure to people and other dogs, the Greyhound has developed into very loyal and affectionate house pet. Today, the Greyhound adores human contact and many owners will tell you how they are often ‘shadowed’ as they go about their daily routine. This breed makes a grand companion in a household where the family has the time and energy to give the dog adequate exercise.